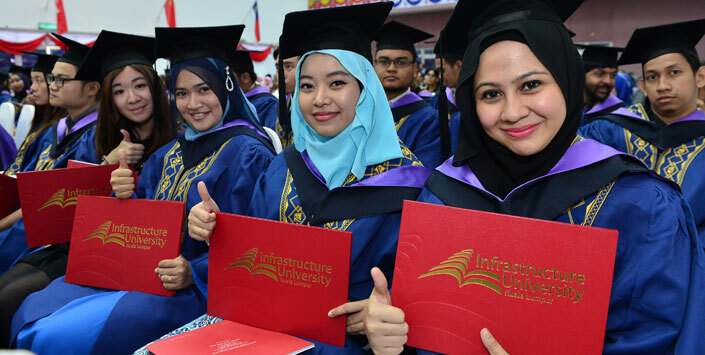 5 September 2015 was a significant day for the 840 graduates of the Infrastructure University Kuala Lumpur (IUKL) as they received their PhDs, Masters, Bachelor Degrees, and Diplomas from the Chancellor of Infrastructure University Kuala Lumpur (IUKL), YBhg. Tan Sri Datuk Ir. (Dr.) Wan Abdul Rahman Bin Wan Yaacob, and the Pro-Chancellor of IUKL, YBhg. Academician Datuk Ir. (Dr.) Lee Yee Cheong, at the 13th IUKL convocation ceremony. 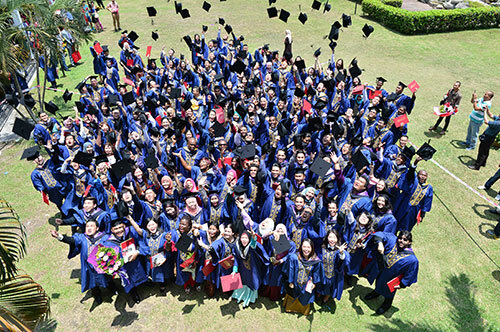 The graduation ceremony was held in three sessions. The conferment of PhDs, Masters and Bachelor of Civil Engineering (Hons) was completed in the first session and was presided by the Chancellor. The presentation of the Chancellor’s Award and the Vice-Chancellor’s Award to the top students was also presented in this session. This year is also a momentous one for IUKL as the first Honorary Doctorate was conferred. 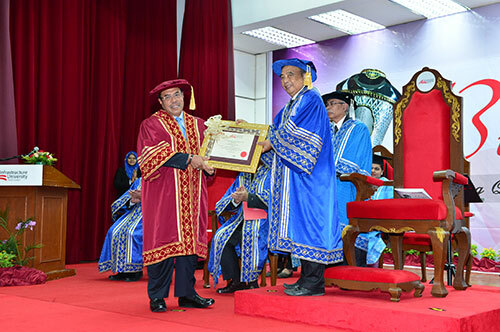 The Honorary Doctor of Management was conferred to YBhg. Tan Sri Datuk Seri Panglima (Dr.) Aseh Bin Hj. Che Mat, the former President of Putrajaya Corporation. 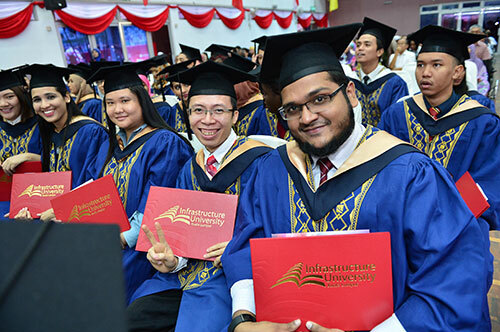 The Pro-Chancellor conferred the Bachelor Degrees for other programmes in the second session and diploma programmes in the third session in the afternoon. The Chancellor’s Award recipient was Ann Teh YinLi (Bachelor of Civil Engineering (Hons)) who is also the Valedictorian of the year, and the Vice-Chancellor’s Award recipients were Fatimah Aliaa Binti Azlan (Bachelor of Communication (Hons) in Corporate Communication), Abdul Salaam (Bachelor of Technology (Hons) in Construction Management), Chai Kah Wai (Diploma in Architecture), and Kor Pui Yeng (Diploma in Corporate Communication). For the second year now, IUKL has introduced the Industrial Awards, which are given by our industry partners to reward students who have demonstrated outstanding academic achievement as well as active co-curricular involvement. 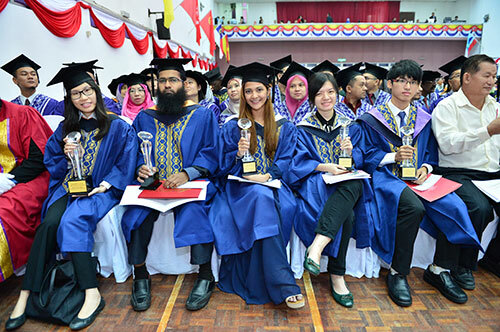 The seven recipients of these awards are Muhammad Zaki Bin Ismail (Bachelor of Technology (Hons) in Water and Wastewater), Tandin Gem (Bachelor of Technology (Hons) in Construction Management), Chong Min Kent (Bachelor of Civil Engineering (Hons)), Mohd Azmil Bin Abdull Sedik (Bachelor of Business Administration (Hons)), Sherine Chong Yean Ling (Bachelor of Accountancy (Hons)), Jamuna D/O Thurai Singam (Diploma in Biotechnology), Leow Pei Theen and Aiman Nabillah Binti Zulkafli (Bachelor of Communication (Hons) in Corporate Communication), and Norhafizah Binti Mohamad Ariff (Bachelor of Science (Architectural Studies)). 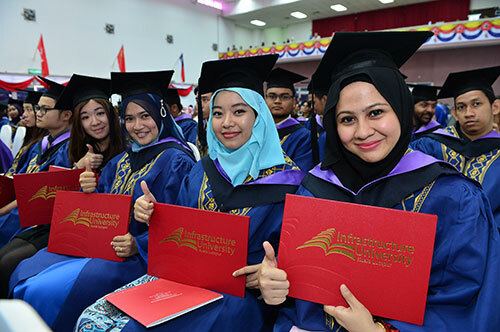 These students received awards from prestigious companies such as Wiranda (M) Sdn Bhd, Ardhmillenia Sdn Bhd, Wah Seong Corporation Berhad, Takaful Ikhlas Berhad, KM Capital Group Berhad, Fisher Scientific (M) Sdn Bhd, Asia Media Sdn Bhd, and Kumpulan Ikram Sdn Bhd which is a subsidiary of Protasco Berhad. 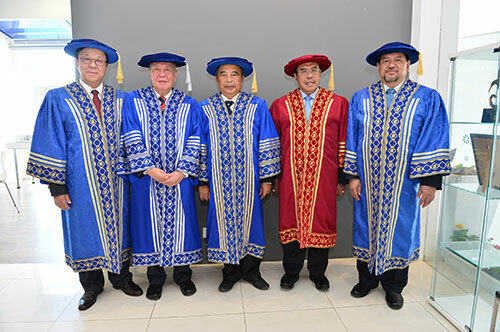 Held at the university’s main hall, the event was also witnessed by the President and Vice-Chancellor of IUKL, Prof. Dr. Roslan Zainal Abidin, the Executive Vice-Chairman and General Managing Director, YBhg. Datuk Sri Ir. Chong Ket Pen, the IUKL management team, parents, representatives from the embassies and distinguished guests. Copyright © 2019 Infrastructure University Kuala Lumpur. All Rights Reserved.